The NGO Platform on Shipbreaking is a coalition of 19 environmental, human and labour rights organisations working to prevent the dangerous pollution and unsafe working conditions caused when end-of-life ships containing toxic materials in their structure are freely traded in the global marketplace. Through their “Off the Beach” campaign, they aim to raise public awareness of the human rights issues and pollution caused by shipbreaking practices in South Asia and to promote marketplace incentives to divert traffic away from the beaches. A representative of the Secretariat recently sat down with their Executive Director, Patrizia Heidegger (a German national), and Ingvild Jenssen (a Norwegian and French national), who is the founder and a Policy Advisor with the Platform, to find out about their main motivations for undertaking this challenging work. Ingvild: After finishing my Master’s degree in Political Science in Oslo, moving to Brussels made sense to me as it is the epicenter of European politics and an exciting place to be for a political scientist. I became involved in the shipbreaking issue over 10 years ago when there was an effort from NGOs in Europe to persuade the European Union (EU) to work on this issue, which sparked the interest of the EU Commissioner at the time. With shipbreaking having been successfully implanted into the EU agenda, the decision was taken to form a coalition of the NGOs working on this issue which became known as the NGO Platform on Shipbreaking. The first high-profile case the Platform was involved in was the export of the decommissioned French aircraft carrier, the Clémenceau, to India for breaking. As a result of our and partner’s campaigns, President Chirac ordered the vessel be returned to France in early 2006. The ship was eventually dismantled at a facility in the Northeast of England in 2010. This incident also provided the impetus for the Supreme Court in India to develop specific rules on the issue of shipbreaking. Seeing the successful outcome of this case gave me a strong motivation and momentum to continue this work. Patrizia: I’m also a political scientist by trade, and have always had an interest in South Asia, having travelled there extensively. My work prior to joining the Platform was human rights based: I even had the opportunity to work for a human rights NGO in Bangladesh for a year and a half. It was during this time that I became aware of the ship breaking issue. I joined the Platform in October 2012 and was immediately absorbed by the complexity of this industry which has implications for human rights, labour rights, the environment and in particular, the dangers associated with toxic chemicals and wastes. Beyond the issue from a developmental standpoint is the definitive link between what happens on the beaches of Chittagong (Bangladesh), Alang (India) and Gadani (Pakistan) with the global shipping industry, which we know has many ties within Europe. It was hard not to be drawn into such a fascinating and challenging issue. What are your main inspirations and passions in doing the work that you do? For both of us, a huge inspiration is being able to work with such a wide array of organizations and with people of differing backgrounds. 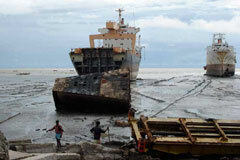 This gives us a real insight into the motivations of the main stakeholders involved in shipbreaking. The breadth of our work spans from persuading European shipowners to adopt, and cargo companies to insist, on responsible ship recycling practices (i.e. away from the beaches of South Asia) to defending workers and their families in the case of injury, and even death, at the shipbreaking yards. Our partner NGOs in developing countries are also a source of great inspiration – in some developing countries, working as an environmentalist can be a dangerous profession, some have even received death threats. Nevertheless, they carry on with their mission regardless, these are the true heroes. In what situations do you really feel you’ve made a difference? The Platform has brought cases of certain ships being illegally exported to Bangladesh and India before the courts in these countries. As a consequence of the courts’ involvement, there are now sector specific regulations on shipbreaking in Bangladesh and India. In India, authorities have also set up a hazardous waste disposal and treatment facility. Something we continue to work on is the implementation of shipbreaking regulations in these countries, which to date remains quite weak. Our work, which also includes research and cooperation with other experts, has resulted in a significant increase in the coverage of the shipbreaking issue on the media, particularly in South Asia. Recently we had a great week, during which the European Commissioner for the environment clearly stated that the practice of European vessels being broken on South Asia’s beaches needs to end. That same week we also confirmed that funding was available for us to be able to continue our valuable work (the European Commission is our main donor). Another major coup was our role in ensuring that 11 major cargo companies will insist that responsible ship recycling practices be adopted in the annual contracts they sign with shipowners. Corporate social responsibility is obviously a huge concern for companies who suffer greatly from negative publicity. In addition to these 3 success stories, this week really stands out for us as it was one of the rare occasions when we had both policy makers and business stakeholders “on our side”! How do you perceive working in a male dominated setting? The shipping industry is largely a male domain. This, coupled with the fact that we are viewed as critics of the industry, makes for interesting dynamics. Having said this, while you can’t help but notice when you attend shipping conferences and address audiences which are over 90% male, at the end of the day, we don’t necessarily feel that our impact would be any greater if we were men. After all, some of our strongest partners within the Platform are female. Rizwana Hasan, Director of the Bangladesh Environmental Lawyers Association (BELA) and a partner in the Platform, created great publicity for our cause when she won the Goldman Environmental Prize in 2009. Read more about these inspirational women and the work they do on the website of the NGO Platform on Shipbreaking: http://www.shipbreakingplatform.org/.